Play golf across Manhattan using your iPhone. 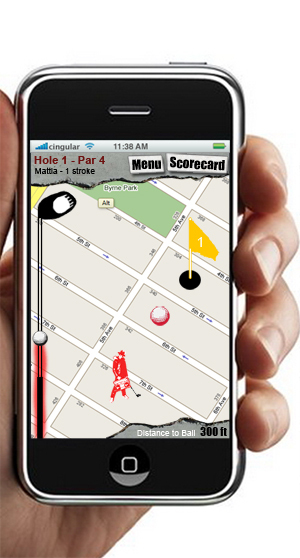 With Gigaputt you can use your iPhone to play a round of golf right through downtown New York. Just swing your iPhone and drive a virtual golf ball across a Google map of New York toward 18 virtual holes spread around Times Square. Then saunter over to where your ball landed for your next shot as you drive towards the green. We'll have an iPhone with app installed just waiting for you. We'll send out two groups at a time to play. When one group comes back, the next can head out. If you know golf, you know Gigaputt. Swing your iPhone to knock your ball towards the hole. Walk to your ball on the map to hit it again. Can't reach your ball? Take a mulligan. The phone will tell you when it�s your turn. Look both ways and have fun! Gigantic Mechanic makes casual iPhone games with innovative location-based elements. The company was founded by Mattia Romeo and Greg Trefry.